My top favourite goalkeeper in the world and the in my opinion the best is Iker Casillas Fernández. He is 31 years old and he plays for Real Madrid. His date of Birth is 20th May 1981. His place of birth was in Mostoles, Spain. He is 6ft tall exactly. He has a mother and father: his father's name is José Luis Casillas and his mother’s name is María del Carmen Fernández González. He plays for an international football team - he is the goalkeeper of Spain. Casillas has a brother and he is seven years younger, named Unai and he currently plays as a central midfielder for CD Mostoles. Part of his career is being a goalkeeper for Real Madrid. One of the best moments of his career was in the 2007-08 season because it was when Casillas helped Real Madrid to reclaim their 31st La Liga title and he conceded out of 32 goals out of 36 games to claim the Zamora Trophy. In February 2009, Casillas equalled Paco Buyo’s record of 454 matches played (for a goalkeeper) and has since surpassed it to become Real Madrid’s most-capped goalkeeper of all time at only twenty-seven years old. 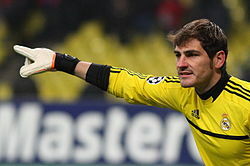 During the 2011-2012 season, Casillas won the IFFHS Goalkeeper award, making him the first and only Goalkeeper to win it four times. On the 2nd May 2012, Casillas clinched his firth La Liga title and his first as a captain of Real Madrid. The other part of his career was playing for the Spaish international team. On July 11th 2010, he captained Spain to their first ever World Cup title with a 1-0 against the Netherlands. In doing so he became only the third ever Goalkeeper to captain a World Cup winning side. In the Euro 2012 Final against Italy Casillas helped Spain win a 4-0. Below are some pictures of him with his Spanish team wining the Euro 2012 final. One of the good things that Casillas does is saves. Below is a short video of him with his best saves for the 2012 year. I hope you enjoy it!